Diets are made to go “on” and “off of”, and if you’re like most people—who want to be fit, lean, alert and healthy—you don’t want to diet. You want to eat naturally and normally, in a way that helps you have the body and lifestyle you deserve to enjoy. 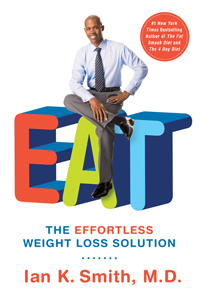 In EAT, Dr. Ian Smith has created a blueprint for you. It’s a flexible and intelligent plan you can follow every day, in every situation—eating out, working late, traveling, cooking for the holidays—and that will urge your body to perform at its peak. You’ll drop any excess pounds you need to lose. You won’t worry about what you “can” and “can’t” eat, but will listen to yourself and eat smart. Carb Heaven: don’t ban carbohydrates—or any nutrient group! The Power of Snacks: they can help you lose weight! Cut to the chase with Dr. Ian’s EAT Plan at the end of each chapter, or become your own expert by reading from start to finish. Either way, EAT is not about denial. It’s about permission….to live, to fuel your strong body, to eat!